The "Butcher of Budapest" - The Washington Post publishes AHF article on the "Consequences of the Secret Speech." AHF Turns 100! A Centennial Call for Membership! FL: The American Foundation for Hungarian Youth and Culture - 1956 Memorial Statue receives go ahead from Collier County Commission! NY: AHF adds eCommerce subscriptions to the Hungarian Weekly newspaper, Amerikai Magyar Szó / a Hid. Sign up online! MD: 1956 Animated Documentary nears completion, needs your support. Meet the filmmakers at May 20th Gala in Washington, DC! AHF Bookstore: New Books Posted! 4/28/2006 - Texas House of Representatives adopts AHF 1956 Resolution and congratulates the American Hungarian Federation on its 100th anniversary. AHF's 1956 Commemoration Committee announced a nationwide effort urging state houses and governors to adopt resolutions honoring the heroes of the 1956 Hungarian Revolution. Texas became the first state to adopt the resolution. Special thanks to Chris Cutrone, President of the AHF Texas Chapter in Austin, and Phillip Aronoff, Honorary Consul of Hungary in Houston. 4/19/2006 - The American Hungarian Federation and the Hungarian Scouts of Washington, DC May 20th Gala Fundraiser. Proceeds of the evening to support a series of events commemorating the 50th anniversary of the 1956 Hungarian Revolution and the Hungarian historical communities living in the countries neighboring Hungary. Honorary Chairs include Hungarian American community leaders and Congressmen Tom Lantos, Daniel W. Lipinski, Thaddeus G. McCotter, and Frank R. Wolf. [read more and reserve your seat by May 10th!] Yes, you can pay online! 3/22/2006 - AHF unveils 1956 Statue prototype for the Nation's Capital...AHF's 1956 Commemoration Committee is seeking your help to erect a statue in Washington, D.C. devoted to the heroes of the Hungarian Revolution. The AHF plan calls for an actual-size statue to be placed prominently in Washington while we raise funds for its bronze replacement. Seen here with his prototype design is renowned sculptor Gyuri Hollosy, who was responsible for the Boston Liberty Square memorial. At the recent Capitol Reception honoring 1848, Congressman Tom Lantos mentioned his intent to place a 1956 memorial in Washington. We must ensure this remarkable design is selected! Contact bryandawson@americanhungarianfederation.org and join the 1956 Commemoration Committee! 3/15/2006 - AHF members attend Capitol event honoring the 1848 revolution and Hungarian Contributions to Democracy. March 15th marks Hungary's National Day and the anniversary of its historic 1848 democratic revolution led by Louis Kossuth. President Bush said, “I believe the example of Hungary proves that freedom is universal. I believe everybody desires to live in freedom. It's an example that tyranny can never stamp out the desire to be free.” Numerous AHF members joined the event chair, Congressman Tom Lantos and distiguished speakers and guests that included Congressmen Hastert and Pelosi, Defense Secretary Rumsfeld, and Hungarian Ambassador Simonyi. [read more] With Video! 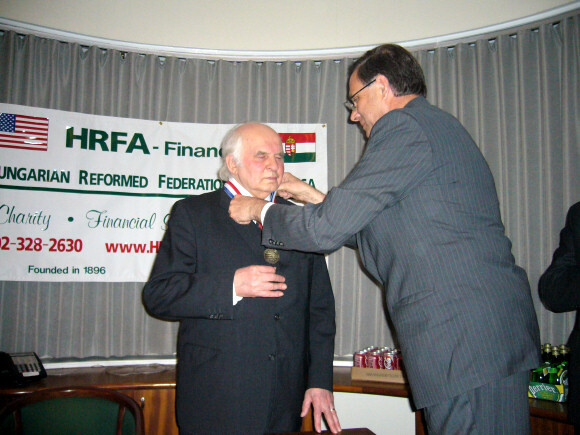 3/1/2006 - Dr. Horváth János Washingtonban: Amerikai Magyar Szövetség Kitüntetése / Dr. Janos Horvath in Washington: Receives AHF's highest honor, the Col. Commandant Michael Kovats Medal of Freedom. 2/27/2006 - New Video posted to the 1956 Portal! "News Magazine of the Screen" presented "Flight from Hungary" in early 1957 featuring video taken after the brutal Soviet re-occupation. "This is battered Budapest under the brutal Russian boot, Soviet tanks roam the streets under the ruins they laid as communist secret police hunt down heroic Freedom Fighters. 25,000 Hungarians are dead." A fascinating video, it also includes news about the Suez Crisis and more glimpes into life during this time. A new book by Rebecca McEldowney and an article by Attila Ürményházi in Tasmania were also added to the publications section. AHF features books and articles written by AHF members on both our main site and our 1956 Portal for publications devoted to 1956. It's time to work together. Bobbie Kalman, an AHF Kovats Circle Member, is a co-founder of Crabtree Publishing and one of the most prolific authors of children's books. She recently completed a book targeted at older children chronicling her experiences as a 9-year-old in the Hungarian Revolution of 1956, entitled "Refugee Child." Bobbie will attend AHF's May Gala in Washington on May 20th. She has donated a number of books and will autograph posters of her "Refugee Child" for participants. Washington 2006 is one of the largest stamp shows to occur every 10 years, and this year SHP has been assigned a booth in the prime area of the Society Booths' section. AHF is preparing commemorative envelopes for sale and Plans are made to have SHP / Washington '06 souvenir covers available at the booth. Naples, FL: The American Foundation for Hungarian Youth and Culture - 1956 Memorial Statue receives approval from Collier County Board of Commissioners! This former AHF paper is now operated by AHF's István Petermann, a young Hungarian-American entrepreneur originally from Transylvania. This well-produced American weekly for the Hungarian community recently expanded its circulation and is now available at over 2500 locations across the United States. This is a full-featured 30-50 page paper that even includes a "Kids Corner." For information, call 1-877-A-MAGYAR. The American Hungarian Federation recently added $1000.00 to its effort at raising funds to the Hungarian Scholarship Fund that supports ethnic Hungarian students in the successor states in the Carpathian Basin. The Federation gave $5000.00 in 2005, and needs your support to surpass that number. Known as the "Professor Paprika," Bela Bognar grows and sells paprika to raise money. [read more] about the Hungarian Scholarship Fund and DONATE! The Hungary Page and "Nobel Prize Winners & Famous Hungarians"
Father of the Volkswagen Beetle, Passive Safety, Occupant Safety Cell, Collapsible Steering System, AND the Seat Belt! Because Porsche was credited with the invention, Berényi went to the German courts in 1955 and won. Barényi asked for only 1 German Mark as compensation.